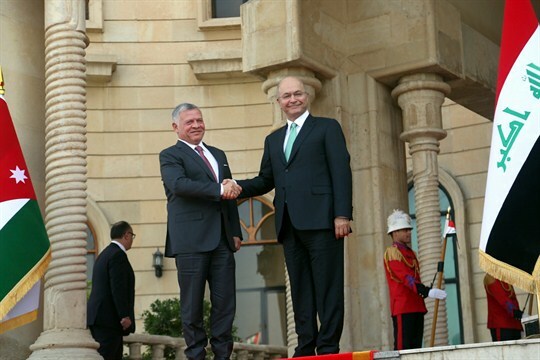 Iraqi President Barham Salih, right, shakes hands with visiting Jordanian King Abdullah II, left, in Baghdad, Iraq, Jan. 14, 2019 (AP photo by Khalid Mohammed). Leaders from Iraq and Jordan held a summit meeting earlier this month, where they signed a slew of agreements liberalizing trade and commercial ties. The meeting, which follows a visit to Iraq by Jordan’s King Abdullah II, is part of a recent intensification in Baghdad’s diplomatic outreach as it seeks to rebuild after its brutal, years-long war with the Islamic State. In an interview with WPR, Randa Slim, a senior fellow at the Middle East Institute, discusses Iraq’s post-ISIS foreign policy priorities.